The Papers Invited® database consists of detailed, comprehensive information about calls for papers with deadlines for upcoming conferences and special issues of scholarly journals. These calls for papers are issued by professional bodies, journal editors, and conference organizers in all disciplines and from all over the world. Papers Invited has established the most well regarded collection of Call for Papers issued by professional bodies, journal editors and other conference organizers in all disciplines. The Papers Invited collection ensures that your journal, conference or event will be discovered by millions of researchers from around the world via the ProQuest family of products. This comprehensive collection can assist researchers at all levels - scientists, professors, post-docs and students who are seeking publishing opportunities for their research papers. Papers Invited is displayed as a tab in the Pivot Homepage. You can run a Basic Search and Advanced Search or Browse by Subject. After run a search using one of the 3 options available, you will see the search results and on the left side of the page, the faceted search that allows you to refine the results by Type, Submission Deadline, Keyword or Country. You can submit your Call for Papers to Papers Invited. Its free and easy to do! Complete the Form with all the information and the ProQuest Team we will do the rest. If you would like more information on accessing the Papers Invited collection, please email support@papersinvited.com for more details. If you are a conference organizer, publisher or other organization with a call for papers and would like to follow up in regards to a recent submission or need assistance with submitting, please email cfp@papersinvited.com. Submitting your Call for Papers to Papers Invited has always been a critical part of organizing a conference or helping to recruit authors for a journal. 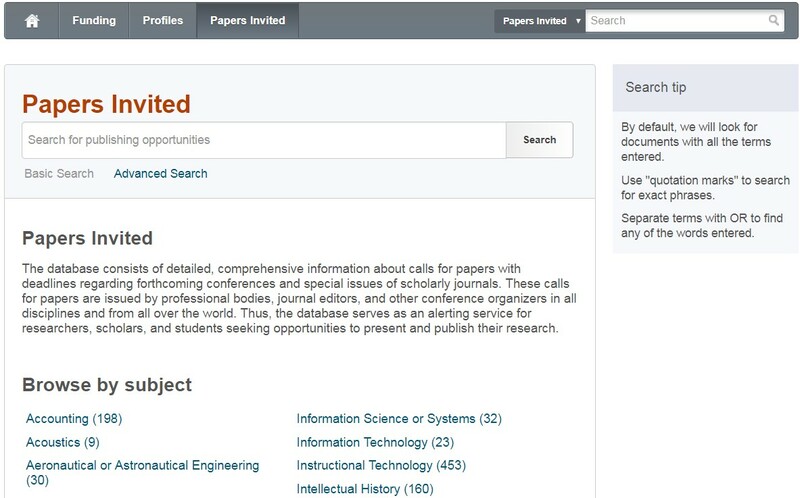 With millions of researchers accessing ProQuest's content platform and Pivot, ProQuest we are able to give visibility to your call for paper to our millions of researchers who use these tools and resources.